An unlikely hero just stepped up for monarch butterflies: the Illinois Tollway Board. The authority, which controls 286 miles of Illinois interstate, recently announced it would explore planting milkweed along three major highways to help support dwindling populations of monarchs, the state insect of Illinois. What a smart move from the toll board. Roadsides are often neglected, wasted spaces. 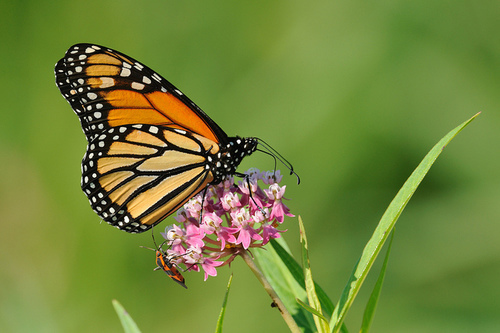 By planting milkweed, a native flower that is the only plant on which monarchs lay their eggs, the tollway board is transforming these forgotten strips of land into much-needed butterfly support networks. Monarch populations have been dwindling in large part because milkweeds have been disappearing from the Midwest, due to the widespread use of the herbicide glyphosate, also known as Roundup, on industrial corn and soy farms. These operations plant genetically modified (GM) crops that are resistant to the herbicide. As GM crops and glyphosate use took off in the Midwest, milkweed and monarchs began a precipitous decline. Just twenty years ago, one billion monarchs flew south to Mexico for the winter. Last year the count was 33.5 million, the lowest ever, and this year's count was the second lowest on record. My colleague Rebecca Riley grew up in Illinois, where she remembers her school teachers picking up little caterpillars from milkweed plants so the class could watch them transform into monarchs. Those little caterpillars are getting harder to find these days. That's why she's working with the toll board to help restore Illinois' once-plentiful monarch habitat, not only along roadsides but also on wetland sites the authority helps maintain. In addition to adding milkweed seeds to their roadside planting mix at designated sites, the toll board will mow roadside grass once a year instead of twice in these areas, cut the grass higher than normal, and restrict herbicide use, making the sites more suitable to migrating butterflies--and saving money on landscaping costs. Some people might be concerned about butterfly safety on roadsides, and understandably so. But the available research suggests that the benefits of roadside habitat, which can provide a corridor of sustenance for butterflies, outweigh the hazards of traffic. The Wisconsin and Minnesota transportation departments are also planting milkweed along roadsides--as are thousands of people, schools, and community groups across the country who are turning backyards, parks and playgrounds into monarch sanctuaries, planting milkweeds through our partner, Monarch Watch. I've been spreading milkweed seeds in my yard, too, to complement some other butterfly-friendly plantings we've done, and I can say there few things as wonderful as watching all the different butterflies flitting around this habitat we've created for them. At NRDC we've been advocating the idea of planting "butterfly highways" of milkweed along the monarchs' main migration route. Now we have a literal butterfly highway! Kudos to the Illinois Tollway Board for seeing this opportunity to turn waste into a smart environmental solution. Transforming the wasted space on roadsides into productive wildlife habitat--and reining in the use of harmful herbicides like glyphosate-- can help keep the monarch migration alive.